RNA silencing at the transcriptional and posttranscriptional levels regulates endogenous gene expression, controls invading transposable elements (TEs), and protects the cell against viruses. Key components of the mechanism are small RNAs (sRNAs) of 21–24 nt that guide the silencing machinery to their nucleic acid targets in a nucleotide sequence-specific manner. Transcriptional gene silencing is associated with 24-nt sRNAs and RNA-directed DNA methylation (RdDM) at cytosine residues in three DNA sequence contexts (CG, CHG, and CHH). 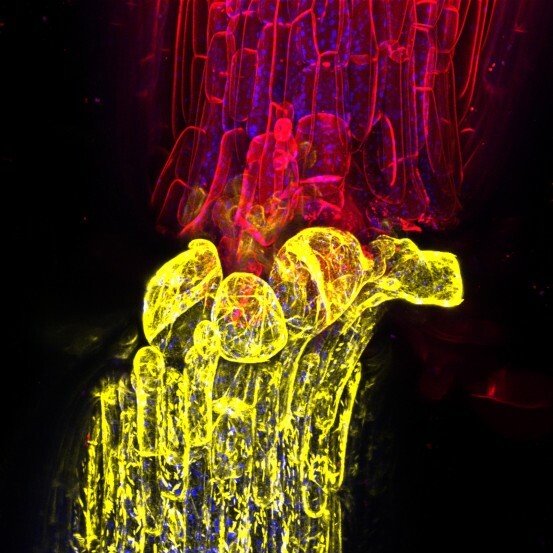 Our collaborators (the Baulcombe lab, University of Cambridge) demonstrated previously that 24-nt sRNAs are mobile from shoot to root in Arabidopsis thaliana and confirmed that they mediate DNA methylation at three sites in recipient cells. We extended this finding by demonstrating that RdDM of thousands of loci in root tissues is dependent upon mobile sRNAs from the shoot and that mobile sRNA-dependent DNA methylation occurs predominantly in non-CG contexts. Mobile sRNA-dependent non-CG methylation is largely dependent on the DOMAINS REARRANGED METHYLTRANSFERASES 1/2 (DRM1/DRM2) RdDM pathway but is independent of the CHROMOMETHYLASE (CMT)2/3 DNA methyltransferases. Specific superfamilies of TEs, including those typically found in gene-rich euchromatic regions, lose DNA methylation in a mutant lacking 22- to 24-nt sRNAs (dicer-like 2, 3, 4 triple mutant). Transcriptome analyses identified a small number of genes whose expression in roots is associated with mobile sRNAs and connected to DNA methylation directly or indirectly. Finally, we found that sRNAs from shoots of one accession move across a graft union and target DNA methylation de novo at normally unmethylated sites in the genomes of root cells from a different accession.